In most electronic systems, it is necessary to provide information in the visual form for a convenient user interface. 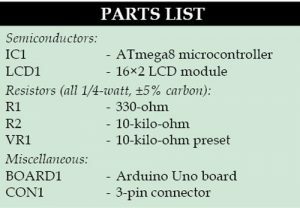 The most commonly used displays in electronic systems are LED, LCD and TFT. 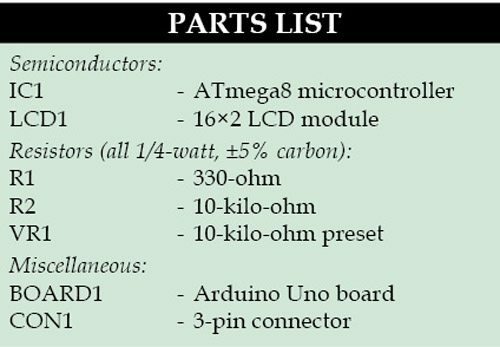 Amongst these, an LCD display is the most cost-effective solution as it can display alphanumeric characters along with special user-defined symbols. It also contains an integrated controller which frees up the main microprocessor from the task of refreshing the display and improves overall system throughput. But at the same time it requires a large number of pins for interfacing with the system, which consume a lot of microcontroller’s ports. 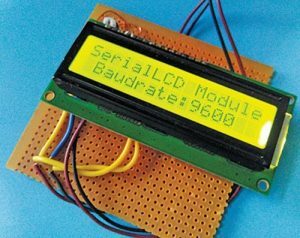 The presented serial LCD module can convert any 16×2 alphanumeric LCD display to a serial LCD which communicates with the main controller using serial communication technique. The brightness of LCD backlight can also be controlled. If the text exceeds 16 characters, the remaining text automatically accommodates in the second line. The serial LCD module communicates on 9600 standard baud rate, which is compatible with all microcontrollers. Fig. 1 shows the author’s prototype of the serial LCD module. Fig. 2 shows the circuit of the serial LCD module connected to Arduino Uno (Board1) using only one wire. Microcontroller ATmega8 (IC1) works with an 8MHz internal oscillator. It uses no-xtal bootloader which provides Arduino compatibility without 16MHz external crystal. Using 8MHz internal oscillator reduces hardware and improves power efficiency. IC1 uses its serial port to communicate with the main controller (Arduino Uno in this case). It acts as a bridge between the main controller and the LCD. ATmega8 can be replaced by ATmega168/328 without changing the code, but the bootloader will need to be changed. 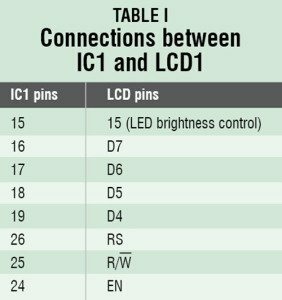 Table I indicates the connections between IC1 and LCD1. The supply to the module is provided by the Arduino Uno itself as shown in Fig. 2. Arduino Uno board. Arduino is an open source electronics prototyping platform based on flexible, easy-to-use hardware and software. It is intended for artists, designers, hobbyists and anyone interested in creating interactive objects or environments. Arduino Uno is a board based on ATmega328 microcontroller. It comprises 14 digital input/output (I/O) pins, six analogue inputs, a USB connection for programming the on-board microcontroller, power jack, an ICSP header and a reset button. It is operated with a 16MHz crystal oscillator and contains everything needed to support the microcontroller. It is very easy to use as the user simply needs to connect it to a computer with a USB cable or power it with an AC-to-DC adaptor or battery to get started. The microcontroller on the board is programmed using Arduino programming language and Arduino development environment. 1. All the required software is provided in EFY DVD and at source.efymag.com. 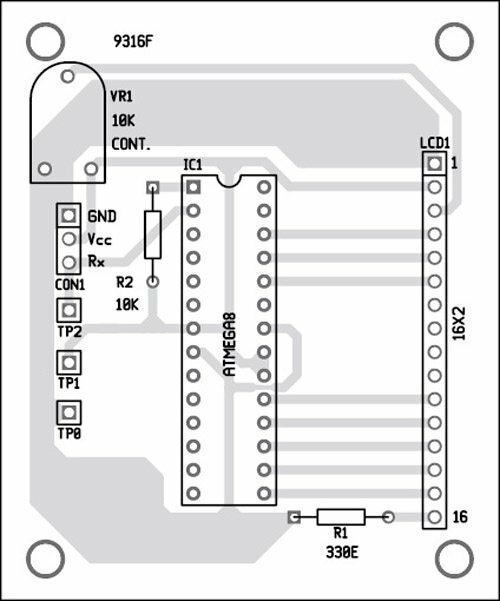 Put the ATmega8 (IC1) chip in Arduino Uno board and follow the instructions: click here. The fuse bits are 0xCA and 0xD4. Program lock bits as 0x0F so that the bootloader is not overwritten every time you flash new firmware. 3. Restart Arduino IDE (Arduino-0022) and you will see a new entry ([email protected]) in the ‘Boards’ menu. Copy the provided code in Arduino IDE and select board as atmega8-noxal. 4. Go to File→Upload to program the sketch in IC1. place back the original microcontroller. Put the programmed ATmega8 chip in the provided PCB and your serial LCD module is ready to use. If you wish to use ATmega168/328, you must choose proper bootloader and board before uploading. Sketch is compatible with all these microcontrollers. You can use serial LCD library if you want to drive the serial LCD module using Arduino Uno. For that, connect the board with the module as shown in Fig. 2 and copy the library (serialLCD) to the libraries folder of Arduino IDE. You can use lcd.backLight( ); function to control the brightness of LCD. 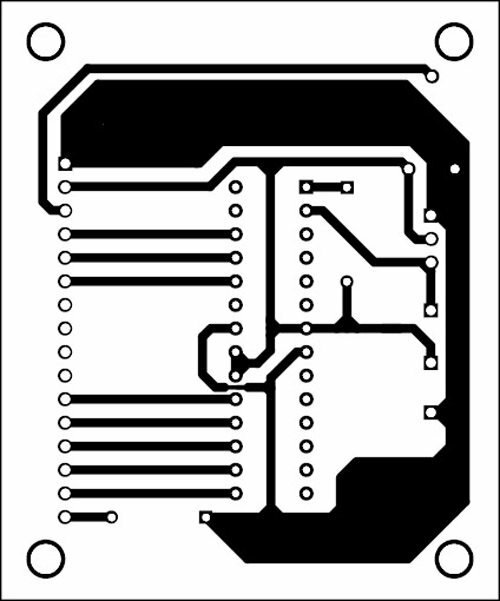 An actual-size, single-side PCB for serial LCD module is shown in Fig. 3 and its component layout in Fig. 4. Assemble the circuit on the recommended PCB to minimise any assembly errors. Use IC base for ATmega8. 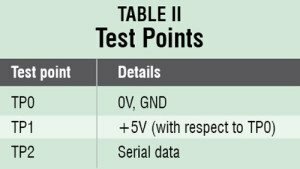 To test the circuit for proper functioning, verify correct 5V supply at TP1 with respect to TP0. The serial data to the LCD module can be seen at TP2 using an oscilloscope.